I would like to paint portraits that in a hundred years would appear as a revelation (…) not by photographic fidelity, but rather (…) the appreciation of our knowledge and our present taste in color, as a means of expression and exaltation character. Van Gogh was right. The color is an important component of the work. Their just distribution exemption elements and shapes too. The artist trains look to color and learn to deal with them, with mastery. His impeccable accommodation results in pleasant sensation, When looking at. The pleasurable effects in the mind of the fan Art are long lasting. 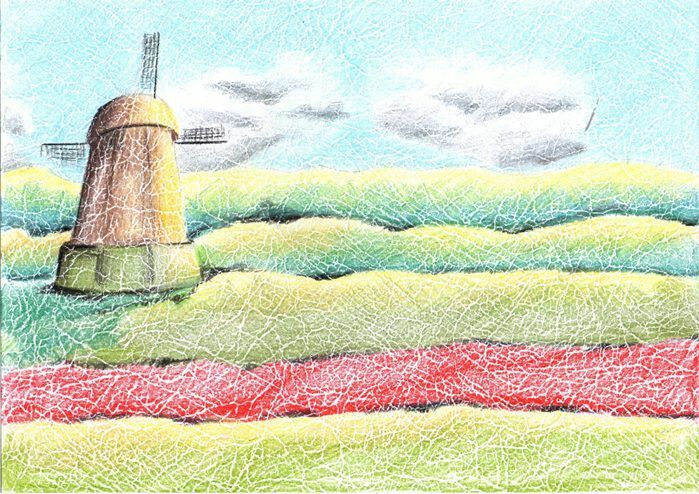 Maybe that's the main ingredient of the work that will be done today, inspired by the fields of the Netherlands of Van Gogh. It is very likely that classical music and passion for art have me transported the flowery fields of Holland, full of colors, in the wind, feeling perfumes of mato, of flowers, under the cozy warmth of the Sun, in the face. They may have missed the details of each petal, of each sheet. But the colour of the fields raised the durable remembrance of colors, Strolling through the white paper, in unequal parallel lines, made waves, as if they were on lazy movement. I speak today of these colors and the will to walk these fields. The raw material of this work is the color and the effect it gives the look, No matter the details, or the accuracy of the form. Fig. 1 – Fields of flowers, on paper with texture, Rosângela Vig. I used a sheet of A4 size, with basis weight 160, with texture (Fig. 1), but the same work was also done in craquelada sheet (Fig. 2) and recycled sheet (Fig. 3), with same size and same weight, with beautiful and different effects on each. From a straight line, made with the ruler, in the horizontal direction, I started my work. It is worth remembering that for both the screen, as for the drawing, This line is essential for the artist directions where the scene is based and where it ends. Did other irregular horizontal lines, How are the fields of flowers, just outlined by free hand, without worrying about the accuracy. Lines must still be made lightly with the pencil, so its contours do not appear in the final, because everything will be painted with very soft colors. Fig. 2 – Fields of flowers, about Crackle paper, Rosângela Vig. The painting must always start from the top down, When it comes to pencils, so as not to soil that has already been painted. Then I started painting the sky, leaving blank spaces for the clouds. I dusted the gray in these blanks, leaving a darker at the bottom of each cloud. Everything done way too light and too loose. In the top field of the scene, Green Moss was critical to give the appearance of distance. Almost blue, This color is ideal for painting of mountains and remote hills. 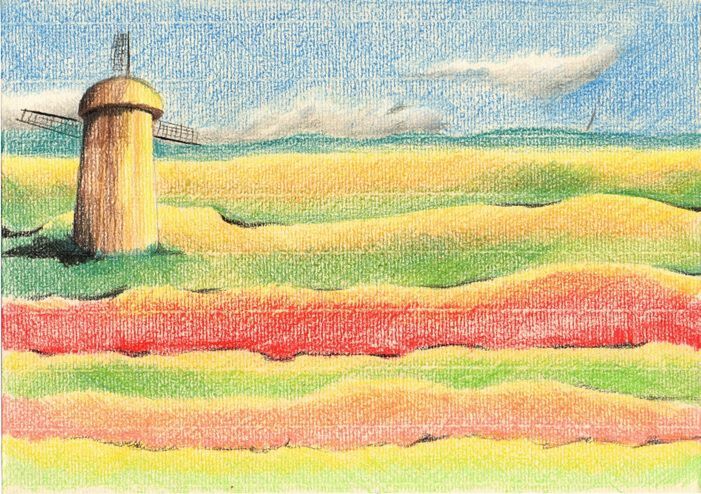 Using the paint on diagonal, with the pencil almost out on hand, for each field, I've been gradually yellow, for the Green, leaving the two colors merged lightly, almost blending. Spotted with darker yellow tone, about the light yellow, for each field, strengthening sunlight. The shades of yellow strengthen the idea of woods or dry flowers. The fact that the lines of irregular fields leads to the feeling of movement of plants, in virtue of the breeze. In the same way as the green fields, I painted the flowery fields with orange and red colors. I like to emphasize that, as the work is being done with freedom, No matter that some points of the fields get a little darker, because that's what highlights the movement and the shadow. Fig. 3 – Fields of flowers, about recycled paper, Rosângela Vig. To make a piece, the artist should always know which side comes the light, in their scene. In this work, the light comes from the right side. Therefore, the painting of the mill must conform to the direction of light and its shadow must be on the opposite side. For this reason, the mill has its right side brighter and the left, darker. For this mill, I used the tones of Brown and yellow. The black color pencil was left finally, for finishing. Reinforced so the shadow of the mill, on the left, about planting and at various points of the flower fields, all very light and loose, without a rule. With the black pencil, still drew the blades, making use of a ruler. 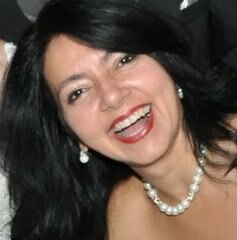 Simplicity is what gives lightness to a work. No matter what the irregular shapes of the plantation. The main element here was the color. 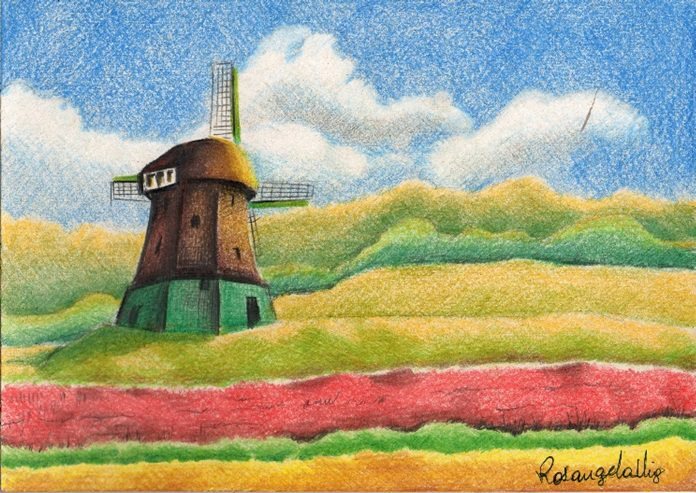 And who create another Holland as this, worth the freedom to dare the field of colors leaving the free spirit. The autonomy of the artist is what makes it a unique work and beautiful. Russian, Martin Ernesto. Grandes Mestres da Pintura, Vincent Van Gogh. Barueri: Sun Editorial, 2007.